Back cover blurb: What would you risk for a complete stranger? When widow Milly Sanger finds injured enemy pilot Lukas Schiller on her farm, the distant war is suddenly at her doorstep. Compassionate Milly knows he’ll be killed if discovered, and makes the dangerous decision to offer him shelter from the storm. On opposite sides of the inescapable conflict, the two strangers forge an unexpected and passionate bond. But as the snow thaws, the relentless fury of World War Two forces them apart, leaving only the haunting memories of what they shared, and an understanding that their secret must never see light. As Milly’s dangerous act of kindness sets them on paths they never could have expected, those closest to them become their greatest threats, and the consequences of compassion prove deadly… A Dangerous Act of Kindness is a beautiful, harrowing love story, perfect for fans of Rachel Hore and Santa Montefiore. 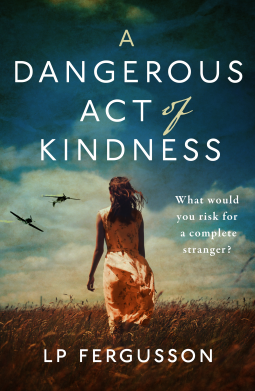 A dangerous act of kindness is available from 28 March 2019.